Fire Chief Andrew Miller of the consolidated fire department will retire officially July 9. Miller, who spent 25 years on the Pacific Grove Fire Department and was chief for 10 years, became assistant chief of the Monterey Fire Department and then became chief when Chief Sam Mazza retired. 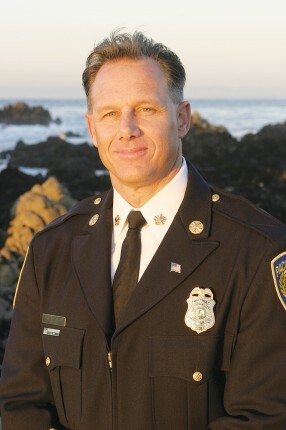 Chief Miller has 33 years fire service experience, including serving as chief of both Pacific Grove and Carmel-by-the-Sea from 2005 to 2008. Newly-appointed Assistant Chief Jim Courtney, also from Pacific Grove, will become acting chief during the recruitment process. Chief Miller is from Pacific Grove. He said, “It has been an honor to have worked with the men and women of the Monterey Fire Department. They are all willing to put their lives on the line for the citizens of the cities they protect.” He pointed out that the individual firefighters and associations have done much in Pacific Grove, including donations to the pool project, the Pacific Grove Library, and to the Chamber of Commerce via sales at Good Old Days. “These people have spent thousands of dollars of their own money on youth sports and the Burn Foundation,” he said with pride. “They carry bank cards and taxi vouchers that they purchase with their own funds to donate to folks they meet on the job who need help.” He added, “Call 9-1-1 and you’ll get a professional, courteous response well within the expected response time. They work hard to exceed expectations. Miller plans to go to Kaui with his family for two weeks right after his retirement, then hopes to reconnect with his family and friends…and to “give back for the great opportunity the cities gave me,” he said. He is a graduate of Pacific Grove High School, Monterey Peninsula College, and Cogswell Polytechnical College. He completed the National Fire Academy Executive Fire Officer program, and he is a California State Certified Chief Fire Officer. Miller was instrumental in engineering the consolidation of fire protection services on the Monterey Peninssula in 2008. Today, the Monterey Fire Department provides fire services to the citizens of Monterey, Pacific Grove, Sand City, Carmel-by-the-Sea, the Presidio of Monterey, Naval Postgraduate School and La Mesa Village.